America’s “Big League of Little Entertainers,” Oklahoma Kids, a division of American Kids Inc., has set a local competition on April 13th, 2019 to be held at the new Kiefer Event Center in Kiefer, OK. The entry deadline is April 9th, according to Oklahoma Kids National Director Nathan Johnson. The membership and competition is open to all youth ages 3 through high school seniors, 18 years old. Nikki Anderson, event coordinator, can be contacted with questions at (620) 875-3731 or by email at Nikki.euphoria@gmail.com. All states are invited to participate in this local competition., and Entry forms and guidelines are available at https://www.americankidsinc.com/forms-2/ and may be used by young performers in all states. All Entry forms are due by April 9th . The competition event will begin with registration at 9 a.m., followed by a brief parents meeting, with the Competition beginning immediately following the meeting. There will be an Awards Ceremony to conclude the day with a wide variety of prizes from cash to medals and trophies for five different age divisions at all levels of competition. The different levels of competition include six categories: Country Vocal, Gospel Vocal, Serious/Classical Vocal, Musical Theater, Popular Vocal, and Specialty Acts. Show the third weekend in July in Nashville, Tennessee. The All Star Show is judged by entertainment industry professionals who will choose our new Entertainer of the Year for 2019. “Our members present a wide variety of performances on the local, state and national level to share their talent for the benefit of others. 2019 will be a very exciting year for Oklahoma Kids with performances in several states nationwide, which are currently being cast,” said Nathan Johnson, National Director. “Members enjoy exposure, growth, character development, and opportunity. Because of the experiences gained from being on stage, members are better prepared for whatever they choose to do in life. Many members are performing on Broadway and on tour with Disney and in Branson and Nashville: Blake Shelton, Kristin Chenoweth, Carrie Underwood, Bryan White, Darci Lynn, and Alaska and Madi are all alumni of Oklahoma Kids,” according to American Kids Founder, Dr. Dale Smith. The Sand Springs Cultural and Historical Museum is currently hosting an exhibit from photojournalist Bernie Guzik, and the museum held a grand opening for “Unseen India” with hors d’oeuvre and a lecture from the artist. Guzik, who now resides in Tulsa, is a Cleveland, Ohio native and experienced musician. He graduated The Julliard School of performing arts in Manhattan, New York, and has performed with the New York Philharmonic, the Cleveland Orchestra, and the Tulsa Philharmonic. He also has extensive travel experience in areas like Kenya, Israel, and Alaska, and his new exhibit comes from a February 2017 visit to rural tribal lands in eastern India. Though he did stop by the Taj Mahal during his trip, most of his time was spent far from traditional tourist locations. The Sand Springs Museum is located in the former Page Memorial Library in the heart of the downtown Triangle District. Built in 1929, its unique style of art deco architecture landed it on the National Register of Historic Places. In addition to traveling exhibits, it also has a permanent display of the unique philanthropic and charitable history of Sand Springs. “Unseen India” will be on display through May 31st. The museum is at 9 East Broadway Street and is open Tuesday through Friday from 1:00 p.m. to 5:00 p.m. and Saturday from 10:00 a.m. to 2:00 p.m. Admission is free. The museum can be reached at 918-246-2509. Sand Springs was named Oklahoma’s “Best Place to Escape To in 2019” by Expedia, and the museum is only one of countless tourist sites in the city. From beautiful murals, scenic drives, the Arkansas River, Shell Lake, Case Community Park, and the Keystone Ancient Forest, there’s plenty for the whole family to enjoy. Formed in 2017, the band is composed of Cliff Scott and Matt Morrison on guitar, Eddie Rivera on bass, and Blake Bush on drums and lead vocals. Sandite Pride sat down with Scott for an interview following the show. Scott began playing guitar ate age twelve. In sixth grade he began playing euphonium in the middle school band, then in high school jazz band he played both trombone and guitar. His first band was “The Jam Band,” which would perform contemporary and classic rock covers at high school basketball games at the Ed Dubie Field House. They also played a gig at the local Nazarene church. After high school Scott attended Ottawa University. “That’s when I found out how much I really sucked at music,” says Scott. “I was eighteen, I had a huge ego.” He graduated with a Bachelor’s degree in music with a concentration in Jazz Studies. In the summer of 2017 Scott, Bush, and Morrison decided to try their hand at Indie Rock, adding Rivera to the lineup under their current name. Rivera is a San Diego native, but the rest of the band is all rooted in Sand Springs. The band released a self-titled four track EP last year that is available on Spotify, iTunes, and other major streaming platforms. They also have another project in the works that they hope to release by the end of the year. Scott describes the band as “under the indie rock umbrella” with elements of alternative rock, heavy metal, jazz fusion, and even contemporary worship. Their Christian faith is a huge driver for the band. Morrison and Bush both attend Angus Church in Sand Springs and Scott plays in the worship band at CrossPoint Church. Scott also performs in Tulsa-based rock band “Handsome Sinners,” with former Sandite Jay White. The Sinners also released a new album last year titled “I’ll Be Damaged,” which can be found on Spotify, iTunes and more. In July Scott got the opportunity to play a song with multi-platinum selling band Thirty Seconds to Mars at a packed Oklahoma City Zoo Amphitheater. Scott entered an online video contest and was selected to perform “This Means War,” a certified-Gold single that tracked No. 1 on the U.S. Alternative charts. The Sunday Finery will play again at the Vanguard on Thursday, March 7th at 7:00 p.m. when they open for “bloom.,” a two-piece rock band from Boston. Tickets are $10 and the show is open to all ages. The inaugural Hometown Holiday Christmas Celebration is underway in the downtown Sand Springs Triangle District. The event, hosted by the Sand Springs Chamber of Commerce, will run through Saturday night at 9:00 p.m. and will resume Sunday from 1:00 p.m. to 6:00 p.m. The event features numerous vendors of crafts and food with nonstop entertainment on the Triangle Stage. Elementary choirs from Garfield, Northwoods, and Limestone performed early Saturday, as did kids from Miss Tirita’s Dance Studio and the Lawnwood Freewill Baptist Church Choir. The Charles Page High School band and Sand Springs Community Band will perform from 6:00 p.m. to 8:30 p.m. and the Triangle will be officially illuminated at 6:00 p.m.
Santa’s Cottage is open for pictures with ole St. Nick from 4:00 p.m. to 9:00 p.m. Saturday and from 1:00 p.m. to 6:00 p.m. Sunday, with a one-hour break from 3:00 p.m. to 4:00 p.m..
New Life Tabernacle and Broadway Baptist Church are hosting the church tent Saturday. Carriage rides will be held from 6:00 p.m. to 9:00 p.m. Saturday. On Sunday the Salvation Army Band will perform from 1:00 p.m. to 2:00 p.m., Ms. Tirita’s kids will perform from 2:00 p.m. to 2:30 p.m. and Kiefer Elementary kids will perform from 2:30 p.m. to 4:30 p.m. Vendors at the event include Scentsy, the Sand Springs Women’s Chamber, Made By Rach jewelry, and OkieSpice & Trade Co.
Mr. Nice Guys’, 3 Feathers BBQ, and Mr. Whiskit’s Cheesecakes are among the dining options. Senior Celebration is selling tacos, CubScout Pack 14 has beef jerky, and dessert can be found at DJ’s Sweet Kitchen. The CPHS Dance Team has hot coco, cookies, and Sandite yard signs, while the band is selling popcorn. Many downtown shops will have extended hours during the weekend festivities, and throughout the Holiday season. Visitors can also check out the internationally-acclaimed Shiny Happy Blue Dog art exhibit by George Rodrigue at the Sand Springs Cultural and Historical Museum. Sand Springs, OK - The City of Sand Springs Parks staff received two statewide honors during the Oklahoma Recreation and Parks Society (ORPS) annual conference held in Norman, OK. Sand Springs Riverfest was cited an Award of Excellence by parks professionals in the state, one of only three such awards given out annually at the parks conference. Riverfest also earned an Award of Excellence for marketing from ORPS. Riverfest was created by parks staff to celebrate the completion and dedication of the former River City Park into the new $6.2 million project known currently as Case Community Park. The park name change recognized Mike and Pat Case for their $2 million contribution toward Sand Springs’ largest Vision 2025 park project. Sand Springs Riverfest took nearly a year of planning thanks to a large committee that included local businesses, school and city officials, church members, and more. The event was held in September of 2017 after raising nearly $30,000 for the park celebration. A few highlights of the day included an appearance by Sand Springs racing legend Bennie “The Wizard” Osborn, who was the NHRA top fuel dragster world champion in 1967 and 1968. The OKC Thunder’s mascot, Rumble, made an entrance, and helped kick off a Thunder Cares new basketball court dedication and basketball camp for kids. There was an artistic Chalk-A-Thon sidewalk art-chalk contest. A few former cast members from the live outdoor production of Oklahoma performed a brief segment from the musical. The Charles Page High School marching band performed on stage before the Rogues Five took over, followed by local interactive DJ Morgan Ganem’s performance, which was choreographed with the grand finale fireworks display. Sand Springs Riverfest was awarded state ORPS honors for its excellent use of private funds to create the event for citizens; the strong use of volunteers; utilizing creative marketing methods and offering a diverse number of activities for people during the event. For more information on the Sand Springs Parks and Recreation Department visit www.sandspringsok.org and follow them on Facebook. 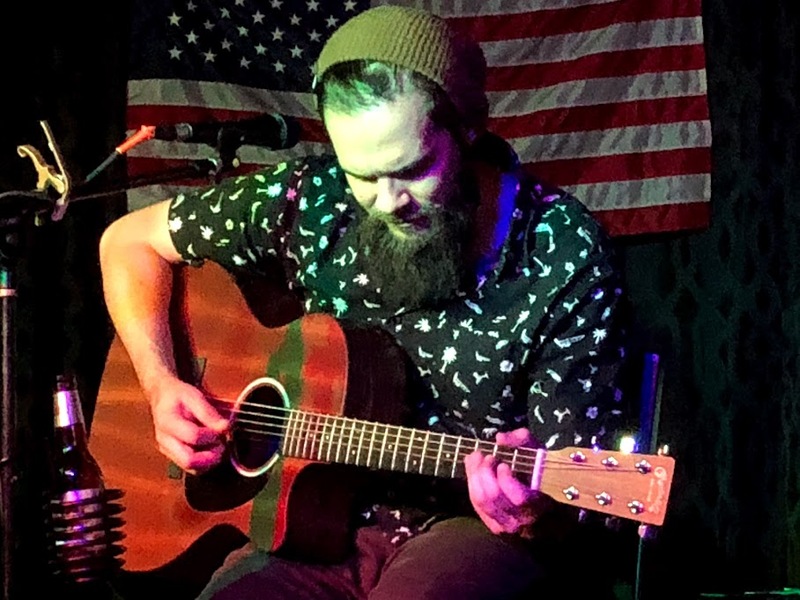 Sand Springs native Jacob Dement has already written and recorded his first full length album, but that’s only half the battle. He needs your help to finish it. Dement recently launched a GoFundMe campaign hoping to raise $3,000 for mastering, duplication, distribution, and an album release event. At press time he has received $730 in donations towards his debut record, Abandoned. A long-time musical veteran, his style has developed drastically from his early exploits with the high school screamo band AfterEIGHT. Dement’s later band, The Sellouts, performed a broad selection ranging classic rock to modern Top 40 hits at venues like Los Cabos, Riverwalk Jenks, and River Spirit Casino. Dement spent years touring the high seas with Norwegian and Carnival cruise liners, performing alongside artists like Heart, America, and Emmy Lou Harris. Upon settling back down in Oklahoma he took up residency at Margaritaville, performing every Tuesday night for a year before moving his act to the Wyld Hawgz bar in South Tulsa. Dement says he averages around 250 shows a year at venues across Oklahoma. In addition to his solo work he has also performed with the Jacob Flint Band and as a duo with Flint. They recently opened shows at Cain’s Ballroom for Granger Smith and a sold-out Randy Rogers Band. His latest work is a more acoustic folk sound and deals with his struggles over the past two years and his separation from his wife and co-performer. He was also nominated for Best Solo Artist and Best Americana Artist, in the We Are Tulsa Music Awards, and his song “Mr. Strange” was nominated for Single of the Year. To vote for Dement, visit https://www.tulsamusicawards.com. Dement recently launched a new website at www.jacobdementmusic.com and can be reached at jacobdement@icloud.com for booking information. The Eighth Annual Boo on Broadway festival was a raging success Sunday afternoon in the downtown Triangle District. The event drew more than 3,000 participants for games, inflatables, costume contests, trunk-or-treats and more. The event was hosted by the Sand Springs Ministerial Alliance for the second-straight year with involvement from several other local businesses and organizations. State Farm agent Steve Lane and Farmer’s Insurance agents Kelly Smith and Nathan Spencer all set up booths with candy, as did American Heritage Bank, RibCrib, BancFirst, Christ Centered Lawn Care, and OSU Medical Center. Downtown businesses Blush Hair Salon, Coble’s Flowers, and Joni’s on the Triangle Hair Salon also participated. New Life Tabernacle was the star of the show, taking over the entire Kingsley Insurance parking lot with numerous inflatables, balloons, popcorn, and a dunk tank. Reach Church set up a bounce house and several game stations. First Church of the Nazarene had a GaGa Ball arena, American Legion Post 17 and Chinowth and Cohen had corn hole toss, and Nexus Youth and HillSpring Church also had setups. The Sand Springs Police and Fire Departments also participated and let the kids check out the insides of their trucks and squad cars. A Toy Story themed car won the best Trunk-or-Treat design and a costume contest was held with several age categories. Pet: Jared Robinson’s pygmy goat (vampire). The Third Annual Monster Ball softball game originally scheduled for Thursday, October 25th has been postponed to Tuesday, October 30th due to substantial rainfall. The Halloween-themed slow pitch softball game will pit the Charles Page High School baseball and softball teams against each other in a costumed slow pitch fundraiser for Sandite Special Olympics. The Lady Sandites won the inaugural event and the baseball team tied the series with an 8-7 victory last year. The game will be played at 6:00 p.m. at the Sand Springs Softball Complex at 408 West 55th Street. Tickets are $3 for students and $5 for adults. It’s officially costume season in Sand Springs, beginning this Thursday. Churches, bars, and other organizations in Sand Springs will be putting on Halloween festivities for all ages. The Sand Springs Pumpkin Patch at 17516 West 8th Street is open every day in October from 10:00 a.m. to 7:00 p.m. Monday through Saturday, and Sundays from 12:00 p.m. to 7:00 p.m. Pleasant Valley Farms at 22350 West 71st Street is open every Sunday through Thursday in October from 9:00 a.m. to 8:00 p.m. and from 9:00 a.m. to 10:00 p.m. Fridays and Saturdays. The Third Annual Monster Ball softball game will pit the Charles Page High School baseball and softball teams against each other in a costumed slow pitch fundraiser for Sandite Special Olympics. The Lady Sandites won the inaugural event and the baseball team tied the series with an 8-7 victory last year. The game was originally scheduled for Thursday October 25th at 6:00 p.m. at the Sand Springs Softball Complex at 408 West 55th Street. Due to rain it has been postponed till Tuesday, October 30th. Tickets are $3 for students and $5 for adults. Tulsa Community College will be hosting their annual Westfest at the 7505 West 41st Street Sand Springs campus Thursday, October 25th from 6:30 p.m. - 8:00 p.m. Admission cost is one canned food item. There will be free games and inflatables, $1.00 hot dogs, and a spook trail for $2.00. The Spastic Cow Food Truck will also be on hand. TCC will also hold a student costume contest Wednesday, October 31st from 12:30 p.m. to 1:00 p.m. in the Student Union with prizes for scariest, funniest, and most creative. The Salvation Army Boys' and Girls Club will be holding a Fall Festival Thursday, October 25th from 6:00 p.m. to 8:00 p.m. at 4403 South 129th West Avenue. It will feature a costume contest, carnival games, inflatables, and a cake walk. It will be $5 per child. Keystone Public School will be holding a Fall Festival Friday, October 26th from 6:00 p.m. to 8:00 p.m with food, candy, and games at 23810 West Highway 51. Chandler Park Community Center will host a Halloween Night Party Friday, October 26th from 6:30 p.m. to 10:30 p.m. at 6500 West 21st Street with hip hop, pop, and electronic dance music. There will be a dance challenge with a cash prize, and D.J. Luc Da Shine will be shooting a live music video. M&M’s Ole Time Tavern is holding their Halloween Party Friday, October 26th at 9:00 p.m. with live music from Ronnie Pyle and the Drivers at 13906 West Highway 51. Garden Heights Free Will Baptist Church will be holding a Fall Festival at 3415 Summit Boulevard, Saturday, October 27th from 6:00 p.m. to 8:00 p.m.
Next Door Bar & Grill at 6430 Charles Page Boulevard is holding a Halloween party on Saturday October 27th with a costume contest and karaoke. The Office on Main’s 5th Annual Halloween Bash is Saturday, October 27th at 9:00 p.m. at 109 North Main Street. There will be door prizes, a 50/50 drawing, karaoke, a DJ, and a costume contest with cash prizes. The Sand Springs Ministerial Alliance will be hosting their Eighth Annual Boo on Broadway festival in the downtown Triangle District Sunday, October 28th from 2:00 p.m. to 5:00 p.m. There will be adult, child, and pet costume contests at the beginning of the event, as well as inflatables, competitions, games, face-painting, and more. Reach Church, HillSpring Church, Church That Matters, New Life Tabernacle, Sand Springs Church of the Nazarene, Harvest Church, Solace Church, St. Patrick’s Catholic Church, CrossPoint Church, Olivet Baptist Church, and First United Methodist Church all participate in the Ministerial Alliance. HillSpring Associate Pastor Matt Barnett says he expects more than a hundred volunteers from those organizations, and a few dozen businesses participating as well. Anyone looking to get involved and help can email Barnett at Matt.Barnett@hillspring.tv. Last year’s festival attracted more than 3,000 visitors. Any businesses or organizations participating in the event are also encouraged to make a donation towards Christmas bonuses for the Sand Springs Police and Fire Departments. The Ministerial Alliance donates several thousand dollars worth of gift cards to both departments every year. Angus Church is hosting a Fall Carnival Wednesday, October 31st from 6:00 p.m. to 8:00 p.m. at 4401 South 129th West Avenue. There will be free games, inflatables, trunk-or-treating, door prizes, free food, and a live classic rock show from Ronnie Pyle and the Drivers. Broadway Baptist Church at 1000 North Adams Road will be hosting a Fall Festival October 31st from 6:00 p.m. to 8:00 p.m. with games, candy, food, prizes, and more. CrossPoint Church is hosting the DreamLand Family Fall Festival October 31st from 6:00 p.m. to 8:00 p.m. at 4600 South 129th West Avenue with games, inflatables, and a petting zoo. Sand Springs Church of Christ will have a Trunk or Treat event October 31st from 6:00 to 8:00 p.m. at 4301 South 113th West Avenue. Sand Springs United Methodist Church will have a Trunk or Treat from 5:00 p.m. to 7:30 p.m. at 319 North Main Street. Jake Dillon Band releases new single "Hunt and Fish"
Sand Springs native and Charles Page High School graduate Jake Dillon Tankersley released the first single off his new album last week on iTunes, Spotify, and other streaming services. “Hunt and Fish” is the first taste of the Jake Dillon Band’s first album, The Little Things. The eighteen-track country album has received a limited digital release for investors in the band’s crowdfunding efforts, and physical and digital purchases will be made available to the public in the near future. Tankersley is a CPHS Class of 2011 graduate, currently residing in Verdigris, Oklahoma. He received extensive radio play in the Tulsa area with his first single, “See You Soon,” while still in high school and recorded the Just Jake EP soon after. He received national attention in the 2016 season of American Idol. Accompanying Tankerlsey are Eric Cope on bass, Casey Highfill on drums, and his brother, Colton Tankersley, on lead guitar. Click here to find “Hunt and Fish” in iTunes or visit https://www.jakedillonband.com/shop to pre-order The Little Things. See the Jake Dillon Band live in concert Saturday, October 20th at the Nusho Theater in Bixby. The third and final Sand Springs Sings preliminary vocal contest went down Tuesday evening in the downtown Triangle District, advancing three more local singers to the November 24th finale. Robert Combs (Tulsa) took first place. Makenzee Rader (Sand Springs) placed second and Alyssa Jason (Berryhill) placed third. Troy Dixon, an Oklahoman National Guardsman from Sand Springs, entertained the crowd with a pair of classic Frank Sinatra songs. Ali Ellison (Cleveland) performed Miley Cyrus’s “Wrecking Ball.” Roger Rister (Glenpool) gave a soulful rendition of “Long Black Train” by Josh Turner. One of the most unique performances of the concert series was from Bulgarian native Mariana Rankin. Rankin performed an original a cappella song in her native tongue about her life growing up in an orphanage. Miscee Smith, Heather Rogers, and Kimberly Bullard advanced from the first concert. Miscee and Dennis Smith performed as a duo in August, but only Miscee will be competing in the finals. Alohilani Mayor, Bryanna Swan, and Mylin Gipson advanced from the second event. Gracee Shriver placed second in September but dropped out and Gipson was named as alternate. Combs was the only man to earn a top three-spot during the series. All nine finalists will compete on November 24th prior to the Sand Springs Small Business Coalition’s Second Annual Christmas Tree Lighting ceremony. Festivities will begin at noon and the vocal contest will go from 1:00 p.m. to 4:30 p.m. The 2018 holiday season is shaping up to be the best in Sand Springs history as new attractions join together with improved existing festivities. The town is well on its way to becoming a holiday destination for tourists across the region. 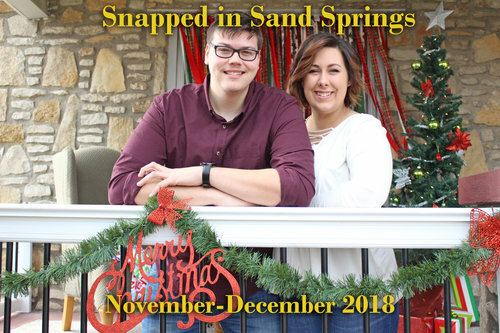 The Second Annual Snapped in Sand Springs event will run November 9th through December 29th. Dozens of businesses, churches, and organizations around Sand Springs will be setting up holiday-themed photo booths for Thanksgiving and Christmas. Some will be indoors, most will be outdoors, and everyone is welcome to stop by and take selfies or family photos. 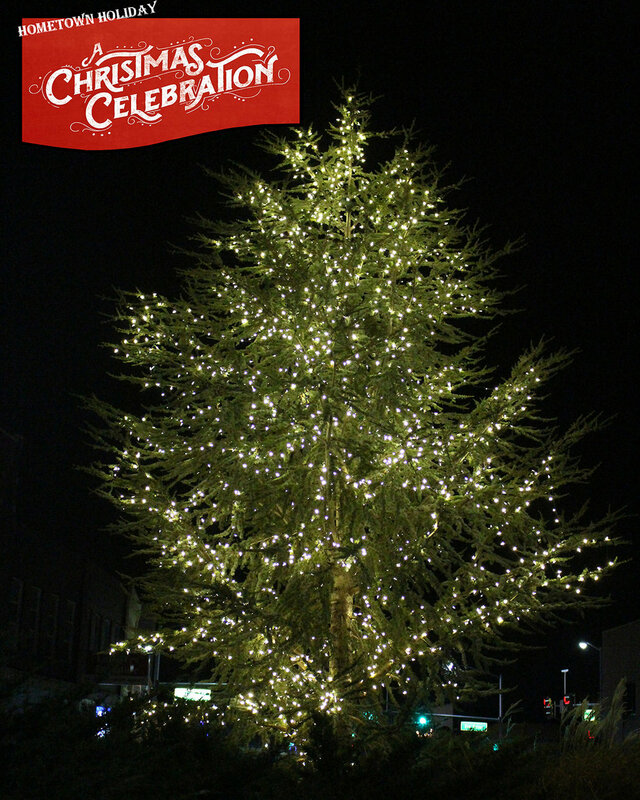 On Saturday, November 24th the Sand Springs Small Business Coalition will hold their Second Annual Christmas Tree Lighting in the downtown Triangle District. Last year the event drew more than a thousand visitors as the city officially kick-started the holiday season with caroling, food trucks, and special holiday hours at the local businesses. This year the Christmas Tree Lighting will be held at the finale of the Inaugural Sand Springs Sings vocal competition. The SSSBC will hold its third and final preliminary qualifier on Tuesday, October 2nd and the top three placers will advance to the November finals. The Festival of Lights Christmas Parade will be held on Friday, November 30th in downtown and will feature Food Network star Kerry Vincent as Grand Marshall. The theme of the parade is “Christmas is the Sweetest Season of All.” Vincent was a judge on Food Network Challenge and has hosted multiple specials for the network as a master of sugar art. She founded and directs the Oklahoma Sugar Art Show every year, which is the largest judged sugar art show in the United States. Prior to the parade, the Chamber will be lighting up all of the buildings in the downtown area with lights purchased through donations from Webco Industries, BancFirst, and the City of Sand Springs. Those lights will remain up through January 1st. The City is also donating a massive tree harvested from the Keystone Ancient Forest. Last year Rod’s Books and Relics hosted their first Christmas Parade of Books, featuring several local authors at lighted tables along Second Street during the parade. The event has yet to be confirmed for 2018, but organizers are expected to announce a decision in the near future. For the first time ever, the Chamber will also be hosting festivities through the entire parade weekend. “Hometown Holiday: A Christmas Celebration” will run Saturday December 1st from noon to 9:00 p.m. and Sunday from 1:00 p.m. to 6:00 p.m. The event will feature choirs, bands, plays, children’s activities, carriage rides and more. The Public Service Company of Oklahoma is donating the funds for a Santa Cottage and Tulsa Technology Center’s Sand Springs Campus will be constructing it so kids can tell Santa their Christmas wish list! There will also be a handful of Christmas characters in full costume wandering the area for photo opportunities. A church tent will be available for local churches to host children’s activities throughout the weekend. Churches can host three-hour blocks of activities. Any club or group will be welcome to set up a free fundraising booth during the event. The Chamber is also open to community suggestions for other events and attractions. 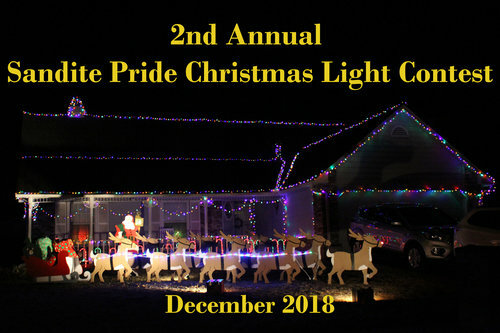 Sandite Pride News will be sponsoring our Second Annual Christmas Light Contest throughout the holiday season. We will be recognizing the best home and best business in the Sand Springs area. Finally, the internationally-acclaimed Blue Dog art exhibit by George Rodriguez will be making its Oklahoma debut at the Sand Springs Cultural and Historical Museum from November 17th throughout the holiday season. For more information on the Christmas Parade and Christmas Celebration, visit the Chamber of Commerce website at https://sandspringschamber.com/. Applications for Snapped in Sand Springs, the parade, and Hometown Holiday can be found at that link. The inaugural Sand Springs Sings vocal competition is shaping up to be a serious lesson in girl power. Alohilani Mayor, Gracee Shriver, and Bryanna Swan took the top three spots at the September 4th semifinal competition and will advance to the finals in November. The concert series is hosted by the Sand Springs Small Business Coalition in the heart of the historic downtown Triangle District. Mayor, 21, is a Hawaiian native living in Tulsa. She took top prize with a powerful rendition of Mack Gordon and Harry Warren's "At Last," a song made famous by Etta James in 1960. Shriver, a fifteen-year old rising star from Owasso, played acoustic guitar and sang "Two Sparrows in a Hurricane," written by Mark Alan Springer and recorded by Tanya Tucker. Shriver has been performing live since she was eleven years old and has nearly 5,000 followers on her Facebook page. Swan, also fifteen, visited from Pawhuska to finish third with a cover of "Cry Pretty" by Oklahoma native Carrie Underwood. Several Sandites competed in the event but failed to advance. Kristin Shipley, 16, adapted Linkin Park's "Invisible" for the ukulele. Kitty Fueshko, a Clyde Boyd Middle School math teacher, sang "God Bless the USA." Troy Dixon, a CPHS Class of 2003 graduate and National Guardsman, sang "Dream the Impossible Dream" while dressed in uniform. Other competitors were George Allen (61, Sand Springs), Ali Ellison (19, Cleveland), Jesse Kennard (Cleveland), Roger Rister (Glenpool), and Mylin Gipson (Tulsa). Mayor, Shriver, and Swan will join Dennis Smith (Sand Springs), Heather Rogers (Sand Springs), and Kimberly Bullard (Tulsa) in the finals on Small Business Saturday, November 24. One final preliminary will be held on Tuesday, October 2nd. 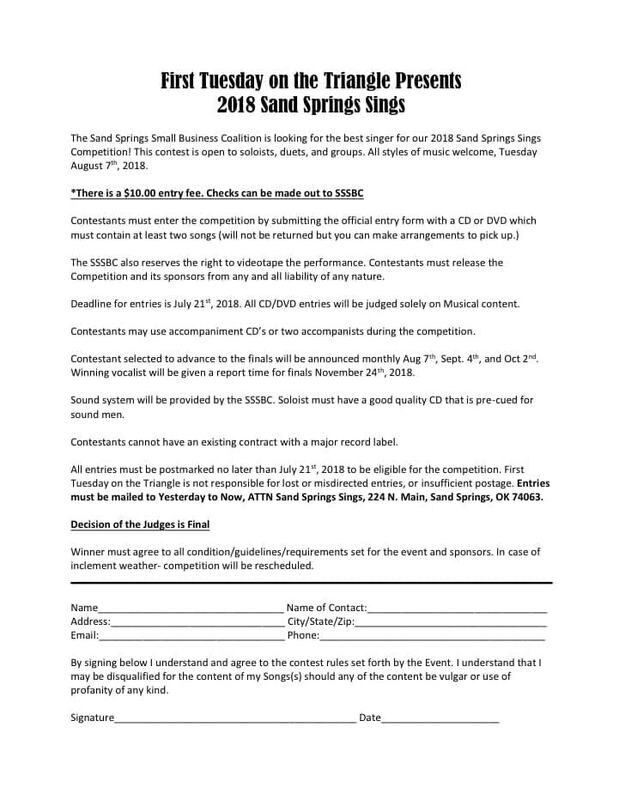 Think you could be the best vocalist in the Sand Springs area? The Sand Springs Small Business Coalition resuscitated the popular First Tuesday on the Triangle concert series in June, and in August they're continuing the festivities with the first ever "Sand Springs Sings" competition. Preliminary contests will be held on August 7th, September 4th, and October 2nd, and the finalists from each month will go head to head in the championship round on Saturday, November 24th. Contestants will perform outdoors in the heart of the historic downtown Triangle District. The competition is $10.00 to enter and free to watch. The winner will take home a trophy and a $500 cash prize. The contest is open to individuals, duos, and groups of any age or genre. The SSSBC hopes the series will attract both locals and visitors who don't typically spend much time in downtown. In addition to coalition businesses such as Yesterday To Now Antiques and Art Mall, The Harvest World Market, and Joni's on the Triangle Hair Salon, there will also be multiple food trucks and local vendors on hand. Those three businesses will have physical entry forms available at their shops. Sand Springs has a long history of producing talented musicians. The Rogues Five saw regional acclaim in the 1960's and played alongside bands like Jim Morrison and The Doors. Sam Harris won Star Search in 1983 and has since recorded several albums and appeared on Broadway. Jake Tankersley appeared on American Idol and is currently producing his second album. Christian rock band Capitol Lights recorded two albums. Morgan Ganem recorded two albums with the band Sownds, had a song adopted as an unofficial anthem of the Kansas City Chiefs, has released two solo albums, and has a residency at Safari Joe's H2O water park in Tulsa. Darin Shipley, Jennifer Marriott, Shelby Eicher, Janet Rutland, and Hannah Rose have all released albums in recent years, and Jacob Dement has a residency at Margaritaville in Tulsa. The City of Sand Springs announced plans for the Second Annual Riverfest celebration Monday. 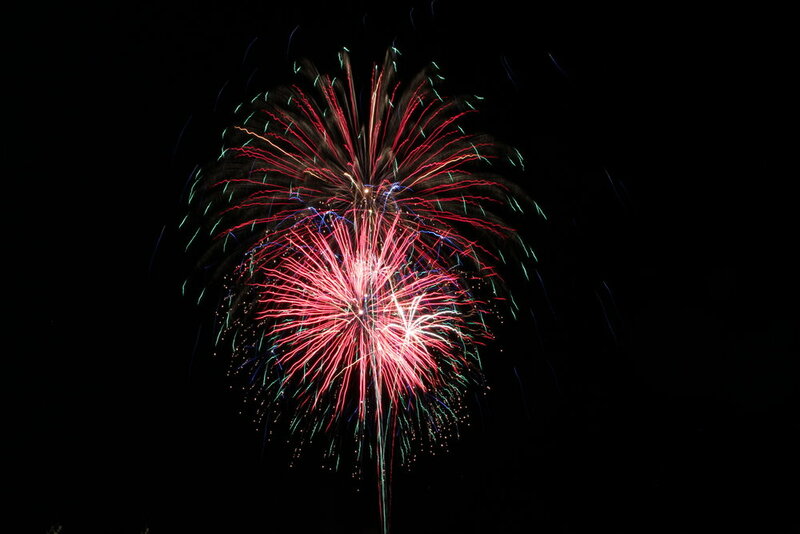 The festival, launched in 2017 to commemorate the Grand Opening of Case Community Park, will be moved forward from September to July 3rd to coincide with the Sand Springs Sertoma Club's 21st Annual Independence Day Fireworks Show. "This is a family friendly event, and we want to invite people from around the Sand Springs area to come to the park, relax and enjoy a fun evening," stated Jeff Edwards, Parks Director for the City of Sand Springs. "We're truly excited to share the great lawn with everyone this year. If you've not seen it, we think you're really going to agree that this special lawn was designed for nights like this." The annual Sertoma Club fireworks show was canceled in 2017 for the first time in its twenty-year history, due to a $6 million renovation of the park, then known as River City Park. Case Community Park, named for community philanthropist Mike Case, features a hundred acres of activities, including baseball, soccer, and softball complexes, a BMX track, beach volleyball, a splash pad, playground equipment, walking/biking trails, a disc golf course, Arkansas River access, fishing, horseshoe pits, a Thunder Cares basketball court, the Case Community Center, and Harper's Hut Shaved Ice. In addition to the usual park perks, Riverfest will also bring inflatables, live music, food trucks, and other activities. The evening begins at 6:00 p.m. with food and free activities in the park. A patriotic bike parade (decorate your bike) kicks off at 8 p.m. near the park entrance and will lead toward the great lawn. This will be the second year for the Independence Day Bicycle Parade, the brainchild of Joni's On The Triangle hair salon owner Joanna Sporleder. Police Chief Mike Carter organized the event to provide a family-friendly festival in lieu of the canceled Sertoma Fireworks Show. 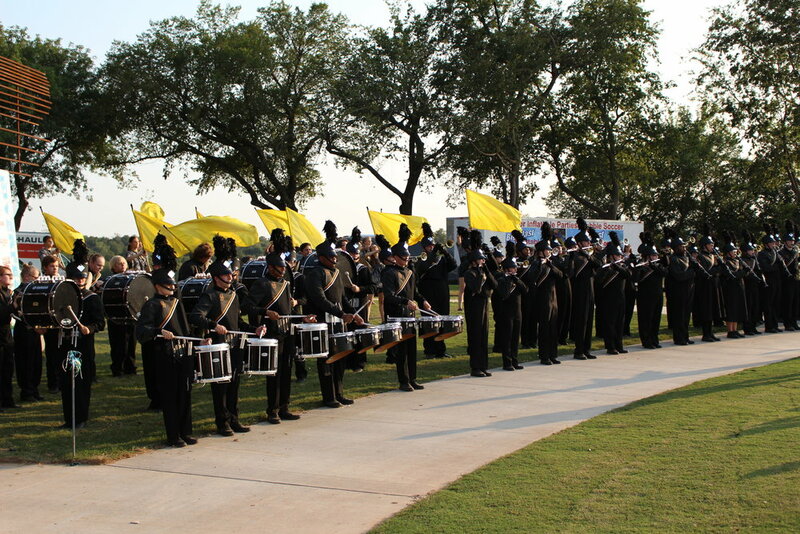 The Sand Springs Community Band will perform on the stage of the great lawn as the sun begins to set over the Arkansas River. Fireworks will start shortly after local sunset at approximately 8:45 p.m. Guests are invited to travel to the park by motorized vehicle and bring lawn chairs and blankets for a picnic style evening on the great lawn. The great lawn is a two-acre well-manicured, high-performance Bermuda turf lawn with an open air stage. Porta potties and restrooms are available. Pets are allowed but Parks staff reminds guests to please keep them on a leash. The park is also a tobacco-free zone. Car enthusiasts will get their money's worth Saturday in Sand Springs. Just a five minute drive from downtown Tulsa, visitors will find a perfect mix of modern and classic, American and foreign vehicles. A smattering of other activities will make Sand Springs a destination all weekend long. From 8:00 a.m. to 1:00 p.m. the Charles Page High School Cheer Program will be hosting the 2nd Annual Cheers & Gears Car Show in the high school parking lot at 500 North Adams Road. The cheer team car show will feature classic and modern cars of all makes and models, as well as trucks and motorcycles. There will be food trucks, face painting, and family activities. From 8:30 a.m. to 2:00 p.m. the Tulsa Jaguar Club will be hosting their 8th Annual EuroMotor Extravaganza in the historic downtown Triangle District at 4 East Broadway. The event will be a fundraiser for the Sand Springs Animal Shelter and adoptable pets will be on hand. Out-of-town EuMoEx participants are invited to stay overnight Friday at Hampton Inn where the club will be hosting a tailgate party at 6:30 p.m. $30.00 day-of registration will be from 8:30 a.m. to 10:30 a.m. Saturday with participant's choice voting beginning at 10:30 a.m. The club will hold a banquet at St. Matthew's Episcopal Church at 601 Lake Drive with dinner and awards from 7:00 p.m. to 9:00 p.m. Cheers and Gears will have day-of registration from 8:00 a.m. to 10:00 a.m. at $25.00. Judging will begin at 11:00 a.m. and awards will be presented at 1:00 p.m.
No need to clear out of Sand Springs after the car shows wrap up, there's plenty of other activities to keep the whole family entertained. From 8:00 a.m. to 2:00 p.m. the Keystone Ancient Forest will be hosting a Hike With Your Dog day. Visitors can choose from half a dozen trails in the 1,360-acre forest preserve, which features 300-year-old post oaks and 500-year-old cedars with wildlife and beautiful scenery. The Charles Page High School Volleyball Program will be hosting a 6-on-6 beach volleyball tournament in the newly renovated Case Community Park, which also features a Thunder Cares basketball court, a splash pad, playgrounds, Arkansas River access, disc golf, and numerous other activities. Five homes in Sand Springs are featured in this year's Greater Tulsa Parade of Homes, including 424 East 48th Street by WSB Homes, which won Best Overall in the $174,999 & Under category, as well as Best Interior Design. To wrap up the evening, families are invited to the 7th Annual Fireworks Preview Night and Kids' Funfest from Big Blast Fireworks at 17516 West 8th Street. For a full itinerary of Sand Springs activities, visit: This Week in Sand Springs (6/17 - 6/24/18). Use the navigation menu at the top of our website to "See Sand Springs" and find other activities, restaurants, shops, and attractions, such as the Sand Springs Cultural and Historical Museum, which is listed on the National Register of Historic Places. An artist from ZegART Studios paints a flower during the downtown concert. Let Slip The Dogs headlines the First Tuesday on the Triangle concert series. Matthew Mitchell, The Broadway Barber, stops by to grab dinner from a local food truck after a long day of cutting hair. Jeremy Myers, Kingdom Concessions, serves up Sonoran hot dogs at Tuesday on the Triangle. The "First Tuesday on the Triangle" concert series kicked off this week in downtown Sand Springs and organizers are calling the first event a success despite unseasonably high temperatures that may have kept some Sandites at home. Let Slip The Dogs battled the heat with some cool tunes, performing a broad selection of covers ranging from The Cure to Stevie Wonder. Local shop owner Stormy Miller opened up the show with guitarist Brian Parker. Though he didn't play any instruments, Miller was instrumental in getting the event organized. His store, The Harvest World Market, sponsored the concert stage and helped secure sound equipment. Several local food trucks were on hand, including Mannford-based Kingdom Concessions with Mexidogs, elote, and fresh-squeezed lemonade. Jeremy and Tammy Myers served up Sonoran-style hot dogs, wrapped in bacon, and topped with refried beans, pico de gallo, and their secret Mexisauce. House District 66 candidate Rusty Rowe used the opportunity to meet local constituents, while his Democratic primary competitor, Angela Graham, took the evening off from campaigning and enjoyed the show with her son. Several local businesses and organizations set up booths around the Triangle, including the Sand Springs Women's Chamber, who works to promote child literacy. The Sand Springs Cultural and Historical Museum was also on hand, taking donations and selling raffle tickets for the Blue Dog Art Exhibit. The concert series has an off-and-on history in Sand Springs, being organized by different organizations throughout the years. The current face of the downtown revitalization is the Sand Springs Small Business Coalition, founded in 2017 by Joni Sporleder (Joni's on the Triangle Hair Salon), Susan Whitley (Yesterday to Now Antique Mall), and Jennifer Barretto (Chinowth and Cohen Realtors). The Small Business Coalition worked together with the Sand Springs Chamber of Commerce and the City of Sand Springs to host the inaugural Christmas Tree Lighting Ceremony which drew over a thousand people in December. The Tuesday on the Triangle series is the first event that the Coalition has hosted entirely on its own. While the Chamber of Commerce works hard to improve the overall economy of the city, the Coalition, which includes several Chamber members, aims to host several events throughout the year to try and increase foot traffic into local restaurants and retail shops. First Tuesday on the Triangle won't be held in the month of July, due to the Sertoma Fireworks Show on July 3rd at Case Community Park. The concert will return on August 7th, followed by September 4th, and October 2nd. The Coalition is also working on festivities for various holidays as well as a poker run and car show in the near future. May 14, 2018- Oklahoma Blood Institute has an exciting adventure in store for donors who give blood to help patients in local hospitals! Oklahoma Blood Institute is proud to partner with Safari Joe’s, which features the Reptile Rush Slides & Raptor Rapids Water Roller Coaster as well as one-of-a-kind reptile and animal attractions. As a non-profit blood center, Oklahoma Blood Institute’s donors provide every drop of blood needed for patients in more than 160 hospitals, medical facilities and air ambulances statewide including all Children’s, Veterans & Indian Hospitals. Approximately 1,200 volunteer blood donors are needed each day to maintain the supply. Appointments are not required but can be made by calling Oklahoma Blood Institute at 877-340-8777 or visiting obi.org. The 29th Annual Herbal Affair & Festival was a dreary event Saturday in downtown Sand Springs. The steady downpour may have turned away casual attendees, but the Sandite faithful didn't fail to turn out for one of the city's biggest traditions. Local businesses like OkieSpice & Trade Co., Keys & Memories, Mile High Designs, and Riddle Plant Farm were joined by nearly a hundred plant and craft vendors from across Oklahoma and even some neighboring states. St. Patrick's Catholic Church provided free plant sitting at several stations throughout the downtown area and Church That Matters hosted a Kids Zone with games, free snow cones, and a petting zoo. A variety of food was on hand, including root beer from Sand Springs Boy Scout Troop 507 and a full wine garden in the newly dedicated Inez Kirk City-Garden Park. Musicians such as Monica Taylor and Anna Massey entertained on the Triangle Park stage, including Sand Springs natives Janet Rutland and Shelby Eicher. Jack Younger was presented with the annual Hometown Hero Award by Vice Mayor Beau Wilson and State Representative Jadine Nollan. Younger recently retired as the Sand Springs Youth Football Association President after thirty years with the organization, which also serves basketball and cheer. The Sand Springs Museum was open throughout the event, showcasing a collection of collectible lunch boxes and aprons, as well as art by Sand Springs Public School students. OkieSpice added to the festivities with the first installment of what plans to be an annual tradition. Westival featured free samples of salsas, BBQ sauces, spices, and other OkieSpice products. OkieSpice suppliers traveled from far and wide to showcase their creations. Pearl Snap Salsas held a challenge with their various volatile cocktails, culminating with the Atomic 12 which is certified at 79,100 Scoville Heat Units and requires a signed waiver to consume or purchase. Sand Springs's own Ruly Sanchez won the challenge.